Experts generally look at the number of generators retired and gigawatts of capacity lost, not plants closed, making it difficult to directly evaluate CNN’s claim. Nearly three times more generator units were retired in former President Barack Obama’s first four years as president than in the first two years of President Donald Trump’s presidency. However, capacity losses have been higher under Trump than in Obama’s first term. CNN’s claim relies on data from the U.S. Energy Information Administration (EIA). The agency tracks the retirement and planned retirement of coal-fired electric generation capacity in gigawatts, not total plant closures. Every coal-fired power plant operates generator units, and as these generators have declined in recent years, so has the capacity of coal power. EIA’s data, which CNN cited to make its claim, shows that the first few years of Obama’s presidency coincided with very low incidences of capacity loss. During Obama’s first term in office, around 15 gigawatts of capacity were lost. About 20 gigawatts of capacity were retired during Trump’s first two years in office. However, capacity loss does not necessarily correlate with the number of plants retired. Of the 4.5 gigawatts of coal-fired capacity expected to retire in 2019, half will come from the retirement of a single plant in Arizona. By contrast, many small plants with far smaller capacity have retired over the years. “Many of the coal plants that retired during the Obama administrations were laggards by industry standards. They tended to be old and small, and ran only a fraction of the time,” Climatewire reported in 2018. Hugh Wynne, an energy analyst at Sector and Sovereign Research, told Forbes in 2010 that coal-fired plants with 220 megawatts of capacity or less made up 22 percent of the country’s coal capacity. If many small plants closed during Obama’s first term, then CNN’s claim may be factually incorrect. CNN did not respond to a request for comment. The Daily Caller contacted numerous energy experts, none of whom could provide a list of plant closures over the past decade. Experts recommended measuring capacity lost or the number of generators retired as better indicators of the effect on the energy market. “I’d argue that the number of plants or generators is less important than the capacity in megawatts or the generation in megawatt-hours. As an analyst, I usually focus on capacity,” Dr. Jeremy Richardson, a senior energy analyst at the Union of Concerned Scientists, told TheDC. The Sierra Club estimates that since 2010, more than 270 plants have retired or announced plans for retirement. But the organization did not respond to multiple requests for data, nor does it publish a timeline of plant closures or break out which plants have been officially retired versus being planned for retirement. Nicholas Steckler, an analyst at Bloomberg New Energy Finance Limited (BNEF), provided TheDC with data that shows that 183 generator units were retired in Obama’s first term, compared to only 63 in the first two years of Trump’s presidency. BNEF estimates that 23 generator units will retire in 2019 and 53 in 2020. 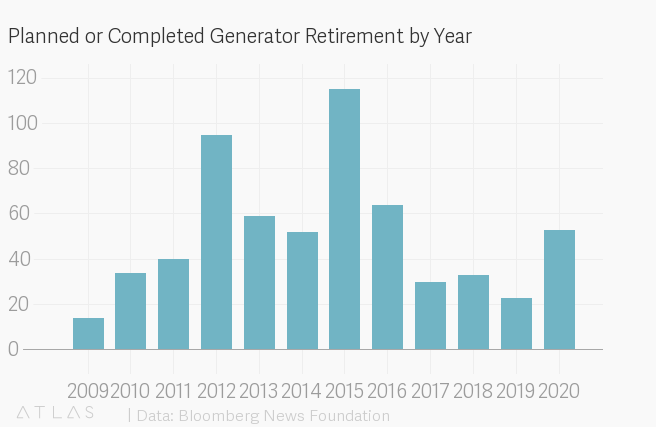 If those predictions are correct, generator retirements under Trump’s first four years in office will still fall below the number of retirements in Obama’s first term. In addition, the number of generator units varies from plant to plant. The retirement of coal-powered generators comes as no surprise to those tracking the issue. The EIA predicted in December that coal consumption in the U.S. would reach a 39-year low in 2018. 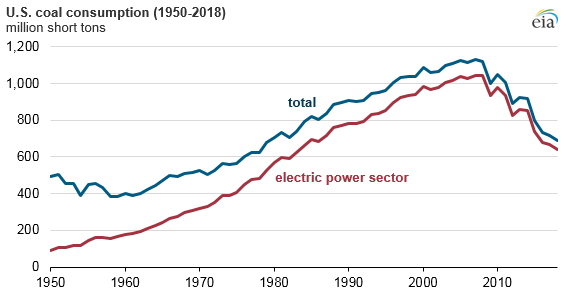 Decline in U.S. coal consumption has occurred alongside an increase in the consumption of natural gas. Natural gas-fired plants have replaced some coal-fired plants in the electricity fuel mix, per the EIA. Benjamin Zycher with the American Enterprise Institute told TheDC that low natural gas prices and regulatory costs imposed by Obama’s Clean Power Plan on coal were the biggest reasons for the shift away from coal-fired power plants in the U.S. However, it’s not all bad news for the coal industry. U.S. coal exports increased by 61 percent in 2017. Exports to Asia more than doubled, while Europe remained the largest importer of U.S. coal. Trump has attempted to scale back the number of plants being retired in the U.S. In 2018, he ordered Energy Secretary Rick Perry to take measures to prevent the planned retirement of coal-fired power.